I have had the camera for a month and I am totally satisfied. I did alot of research and I couldn't be happier with it. I also got the extreme III card from Sandisk and it is very fast. I recently upgraded from a P&S to the Pentax K200D. Although I miss some aspects of the P&S, overall I'm extremely pleased with the K200D. It has a host of features that are lacking from other entry level cameras. Among these are: support for a wide variety of old lenses; in-camera shake reduction; wireless flash capability; SD card; AA battery power; weather sealing; dust removal; pixel mapping; RAW+JPEG. On the negative side: it's missing live-view, a video mode, and is limited in number of continuous shots. * K mount and in-camera shake reduction: these were the main reason why I decided to go with Pentax. I was looking for a deal on an XSi when this showed up. After some additional research, I decided to abandon the Canon and go with Pentax. My first (non-kit) lens was a 50mm f1.7 manual lens. It's near perfect for < $40. I've also learned that Pentax's shake reduction works in three dimensions: horizontal, vertical, and rotational. Other systems lack the rotational dimension. * Wireless flash: sort of lucked into this one. I bought the AF360FGZ to go along with the K200D and found out that it supports wireless operation with the AF360FGZ. This feature almost covers the cost of the flash. Me likey! * SD card: I have a bunch of SD cards and prefer it to other formats. I do need to buy faster and higher capacity cards, though. * AA power: Sanyo Eneloop. Enough said. * Weather sealing: not essential for me but nice to have. * Dust removal/pixel mapping: good additions but haven't used yet. * RAW+JPEG: takes a lot of memory and is slow but I have mine set to record both for now. The JPEG resolution can be set to low for quick emails/copies. As far as the drawbacks, the live-view and video mode were convenient but I've gotten used to the view-finder and also bought a new camcorder, too. For me, the most important part of a dSLR camera system is the lens. So even though this is considered an entry level dSLR, it has enough features and capabilities that'll last me a long time. I am getting lens-buying addiction (LBA), though. After dabbling over tens of different camera models, ranging from Nikon to Canon and Olympus, I settled for the Pentax with much conviction. 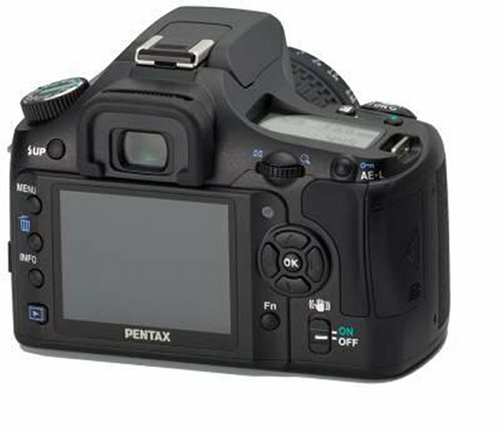 I was drawn towards many of the useful features that Pentax has put into the K200D including: Shake Reduction, Weatherproof Body, Robust Build Quality, use of AA batteries for power, and Backwards compatibility with almost all Pentax lenses since the 70s. One drawback was the effectiveness of Shake Reduction. While it helps for indoor, no-flash photos, it still doesn't compensate for much of the blur and motion. But then, you could still always use a good tripod to fix that. Having owned a Pentax ME Super SLR for more years than I like to admit, and having had a Minolta digital point and shoot for a few years I decided it was about time I bought a DSLR. I used to shoot slide film all the time, but it is now getting ridiculously expensive to develop and hard to get hold of. I wanted to use all my old Pentax lenses so the K200d seemed a natural progression. I bought one from Amazon with the 18-55 lens autofocus lens. I am so pleased with this camera!! I have read some negative comments regarding size etc, but to be honest, I love the solid well engineered feel of it and since I bought it I have looked at a Canon and a Nikon and thought the build quality was inferior. I am very happy with my purchase. I researched cameras for about a month and finally decided on the K200D. I am very happy with my decision and cannot imagine a better product for the price i paid. I highly recommend this camera to any looking to upgrade from a point and shoot to an intermediate to experienced photographer. Of course it doesnt have all of the feature of high end pro cameras, but it does have a lot more than you'd expect from an entry level DSLR. Especially when compared to the offerings from Nikon (D40-D60) and Canon (XTi-XS). What more can I say? I've had this camera over 6 months now. I used to use a Pentax K1000, went to point and shoot digital while my K-mount lenses collected dust, but became disenchanted with the limits of digital P&S cameras. Several friends were buying Nikon or Canon dSLRs. NIkon owners loved how they accepted older Nikor lenses. Envious, I was thrilled to find that Pentax has an affordable dSLR that'll accept my older collection of lenses. Although the K200D is considered an entry level dSLR, I'm amaized at all it can do. The image quality is superb. Its rugged, straight forward, a lot of fun. I've taken it on horse rides in the Rockies, bird watching in snow and single digit (F)temps and it worked flawlessly - and still does. I've never experienced any problems, not even with the lcd preview screen or battery life even in near zero F temperatures for several hours. BTW, I've been using the rechargeable AA Energizer NiMH batteries and am getting flawless results for hundreds of pictures (well over 500) before needing to replace with a fresh set. The Pentax K200D is a pleasure to use. I purchased it for my wife, who has not been happy with the point-and-shoot digital cameras we've been using for the past few years. She cut her photographic teeth on a Pentax SLR many years ago and has missed using it. This camera has brought my wife back to photography in a big way. The feel of it, the comfortable and sensible controls, and the accuracy and stability of the shots has her (and me!) taking shots more frequently. The images are great, with lots of detail and depth. When we want to zoom in for sports shots, we swap out the lens that came with the kit for an old zoom lens that's more than 20 years old. That compatibility ensures we keep the value of our old gear while we get fantastic photographs. This is an amazing camera. It's a great camera. I'm a good 35mm photographer learner D SLR's for the first time and this camera has a lot of great settings to help out in the beginning of the process or for someone who can zoom in and ut but basically wants high quality family snapshots. I have a few problems with the controls, as I am yet unable (after a few weeks) to operate the F-Stop/Aperture setting which I can do easily on other brands. But I'm sure that as soon as I actually finish reading th huge manual I'll be able to do it. For now, the dials, though I looked them up are confusing, esp. since some of the things you have to do through menu, not dials. No battery pack-- something I thought would be a CON is great. Lithium AA lasted for over 1800 pics with Shake Reduction on always, constant review, and about 1/4 built-in flash use. (I don't have the additional battery grip). It will take any AA including rechargeables (though they claim they aren't recommended for best function I haven't had a problem and regular throw aways). I bought this camera because it is in a lower price range for its features-- most other lines only offer shake reduction built into the body of the camera in the next price range along with the huge amount of preset picture modes and options for creativity (the advanced modes). I haven't found the dials as easy to use as friends' Canon's (I can pick them up and change the settings without knowing their cameras)but I like this camera better, and the same product is available for a cheaper price. It also fits my set of PENTAX 35mm lenses which is a no brainer and a unique quality. It is simply the best of its class overall. I love PENTAXES. I was a Canon person in film. Did not like the feel & handling of Canon lower model cameras. Their images turn out soft as well. I like PENTAX colors more than Nikon's. 1. Both offer the same features and functions, but K200D is cheaper. 2. The only key differences between the 2 are that K10D has a pentaprism viewfinder, whereas K200D has a pentamirror. This doesnt cause any change to the quality of pics taken. The second is that K10D, being the prosumer camera, has most of its functions adjustable manually without having to go into the menu. In K200D, these must be set in the menu settings. Again, no big deal. Just a convenience. 3. K10D is heavier than K200D. For an outdoor person like myself, the weight is an important factor when I am walking on rough and uneven trails for many hrs. With the bag, and camera around your neck, and your friends hurrying you up, you dont want a very heavy camera. 4. K200D is a camera released 2 years after K10D. Its most likely that there are improvements in the software, bugs fixed, if any. 5. K10D only has manual modes. K200D has both preset modes and manual. I see no harm in having the preset modes, even though I dont intend to use them. Might help when I have little time to setup and shoot. The K200D camera itself is a very beautiful camera, easy to hold and use. It has a robust design, and great performance, under all conditions. ITs even water and dust resistant. The image stabilization function is very useful. The camera has a pretty big image viewer, which shows high and low contrast areas in the image. Useful function. Some usability issues I noticed was that the function button used for selecting ISO, number of frames, etc, turns off the screen as soon as you select. Thats kind of annoying, because, I would like to see the selection I made on the screen, as confirmation. Overall, very impressive camera, and I love it. See my sample images. I had two Pentax film SLR's for over twenty years, and then came compact digital cameras. I was waiting for a reasonably priced DSLR to move up to. The Pentax K200D fit the bill. I am able to use my three film SLR Pentax lenses on this camera - no other manufacturer supports their film lenses on their DSLR (except for the very expensive full-frame cameras). The features are great and plentiful - too many to mention. And I do not miss the "live view" capability at all (framing your shot on the lcd display), as I am very happy and comfortable using the viewfinder to frame my shots and see the camera's settings. There is some controversy around loss of detail using the built-in JPEG engine which is wonderfully reviewed at [...] I confirmed this loss of detail shooting my dog's hair. As the review points out, if you want all the detail, shoot in RAW and be happy. I also set the camera to use use the Normal setting and contrast/hue/sharpness at 0. I have owned this camera for over four months now, shooting a couple of thousand pictures, indoors and out, landscapes and portraits, parties, the moon and snapshots. I use Picasa for managing my photos (it supports Pentax RAW). I used auto-bracketing, consecutive exposures, shutter priority, aperture priority, ISO priority, manual and automatic. This camera is a blast to hold and to use. Great camera with everything you might need. As there are many reviews about this camera I will keep this one short. -Lots of user settings, but auto settings work as good, it picks up the correct scene every time in auto mode. You will quickly understand the menu UI and different settings as they are very good described both visualy and as text on the screen. -Good VR, you don't hear or feel a buzz, which is good. -I was able to use my old ('87) 35-70 and 70-210 Pentax lenses. Autofocus works as it should razor sharp and exposure is correctly calculated. -The included lithium batteries (AA-size) gave me 750 images instead of the 1200 images as advertised on the box. (12MP JPEG, 10%flash,little screen use). -The power consumption was higher with the 8GB SDHC card I used at first. Now I get about 900 images with a normal 2GB SD card and one set NiMh's GP 2700mA. I think the SDHC cards use more power, stay away from them if you don't need the capacity. Severe underexposure at all settings! I have been a loyal Pentax customer for the better part of 25 years. My first was a fully manual K1000 from 1981. ( Which by the way is still a great film camera ) I used that camera to fill the gap in-between great imaging, and quick imaging in which I use a "point and shoot" digital camera for my digital needs. I have read reviews, and magazine ads waiting for a decent DSLR that can fill my all in one needs, and not fret about having hundreds of dollars of unused lenses, and filters in a case. Well here it is! Though not really addressed in their ads at any length, The Pentax DSLR will indeed fit and use all their legasy K lenses! NICE... all my zooms, wide angle, macro's and filters will be useful again in the 21st century. To my knowledge Canon, Olympus, Sony, etc have missed the consumer boat in engineering their cameras to use the lenses current customers already have in their posession. To be sure, the new lenses will allow for automatic metering, and focus. But for someone who already is comfortable in making my own exposures, and focusing, I can use my stock of lenses that were already invested in.